Boston bombing suspect Dzhokhar Tsarnaev will appear on the cover of the Aug. 3 edition of Rolling Stone magazine. 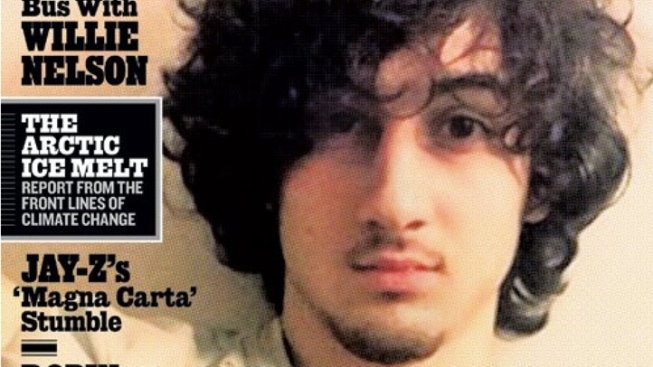 The image used is a self-taken portrait of Tsarnaev sporting shaggy hair and a goatee, with a cover line that simply identifies him as "The Bomber." The story itself was reported over the course of two months by the magazine's contributing editor Janet Reitman and promises to explain "how a popular, promising student was failed by his family, fell into radical Islam and became a monster." Though the same image has been used by other publications in the wake of the April 15 bombing, it's prominence on the cover of the magazine has sparked outrage in the social media realm where some commentators accuse Rolling Stone of giving Tsarnaev the rock star treatment. "I am from Boston and I have lost all respect Rolling Stone," wrote Joseph Lawrence on the magazine's Facebook page. "It's a disgrace to the people that died and were injured and there families to put Tsarnaev on your cover ... It's one thing to be controversial; it's another to be disgraceful." "Who knew Rolling Stone was the magazine for dreamboat terrorist cover boys? Should rename it Tamil Tiger Beat," tweeted @MoRocca. Tom Guerra added his thoughts to the Facebook stream of comments: "Maybe a pic of the little 8 year old boy that was killed by this piece of garbage would have made a better cover. Cancel my subscription to you publication." "Wow, putting this guy on the cover of a pop culture magazine in a Jim Morrison pose? Way to perpetuate the notion that crimes on this level will garnish attention for sociopaths who are out to seek it. This is sickening...," wrote Matthew Adams on Facebook. Rockland, Mass.-based convenience store chain, Tedeschi Food Shops, also said they will not carry the magazine. "Tedeschi Food Shops supports the need to share the news with everyone, but cannot support actions that serve to glorify the evil actions of anyone," the chain announced on its Facebook page. "Music and terrorism don't mix!" Walgreens followed suit announcing via Twitter that they, too, would not be selling the issue. Boston Mayor Tom Menino, who weighed in via a letter to Rolling Stone Publisher Jann Wenner, called the cover ill-conceived and believes it reaffirms a message that destruction gains fame for killers. "Among those we lost, those who survived, and those who help carry them forward, there are artists and musicians and dancers and writers. They have dreams and plans," Menino wrote. "They struggle and strive. The survivors of the Boston attacks deserve Rolling Stone cover stories, although I no longer feel that Rolling Stone deserves them." Tsarnaev pleaded not guilty last week to 30 counts associated with the bombing. He is accused of working with his older brother, Tamerlan Tsarnaev (who was killed during a shootout with police), to set off a pair of bombs near the finish line of the Boston Marathon, killing three and injuring more than 260 others.